OSHA’s Table 1 standards require contractors to take a close look at how they manage workers’ exposure to crystalline silica. 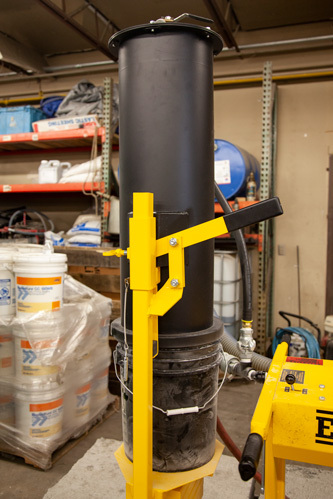 The simplest and safest way for concrete drillers to comply is by installing dust collection systems. 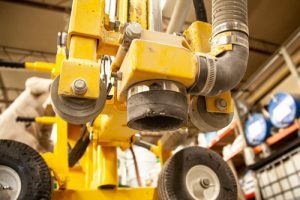 These devices give contractors a foolproof way to protect workers from excessive silica exposure. (For a quick recap on Table 1 requirements, see this helpful resource). E-Z Drill’s dust collection systems have met the new OSHA requirements for more than 15 years, but if you find yourself with an E-Z Drill modellacking dust control, retrofitting a dust collection system is a very cost-effective solution. Here’s a step-by-step look at the retrofitting process. 1. Verify the serial number. Older E-Z Drill models have a slightly different bit guide design, altering the retrofitting process somewhat. 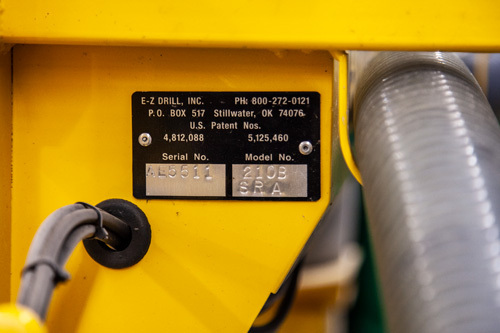 The best way to tell if your drill needs this attention is to find the serial number plate on the unit and provide this to E-Z Drill or your local distributor. The serial number is alpha-numeric — AA-4154 or Z-3985 for example. 2. Install the dust collection head. For newer models, this is a simple process of sliding on the dust collection head. For older models, the upper bit guide may need to be removed and replaced by a new one-piece assembly. In some cases, depending on which unit you are retrofitting you may need to remove the guide stops and/or add a complete guide wheel kit (i.e., the Model 210B-2 SRA). After the new assembly is welded in place, the process is the same as other models. Note that in either case, it’s important to reassemble the guide wheels correctly. They must be set so that the dust boot seals against the concrete, ensuring dust will not escape and will properly feed into the vacuum canister. 3. Install the filter housing and sediment bucket. Mount the canister and sediment bucket as instructed. Make sure to properly attach the 2-inch diameter vacuum hose to the dust collection head and collection canister. Ensure that the hose is not kinked between the head and canister. Contact your local E-Z Drill dealer to get your dust collection system purchased and attached before the busy season returns. It all started with a couple of guys and a problem. Their innovative solution has been changing the world of concrete drilling and doweling since 1987.